After posting a blog I feel I can relax for a little while. All too soon, however, I start to think it’s time to write another but very often it takes something special to spur me into action! Last Tuesday was a beautiful day. Margaret, my sister, and I had been to Words by the Water at Theatre by the Lake in Keswick to hear Jenni Uglow talk about her biography of Sarah Losh, who built Wreay church near Carlisle (well worth a visit). 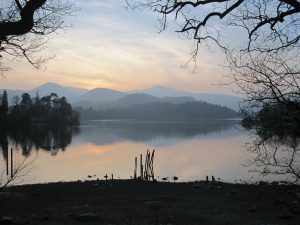 After the talk we decided to go for a walk along Derwent Water shore to Ashness boat landing, cross the road and return along the fellside to Great Wood. It was late afternoon, the lake was still and the air misty. There was very little ‘colour’ and the fells appeared as grey shapes. The sun was shining hazily behind light clouds and then went down behind Causey Pike leaving a pink glow in the sky which was reflected in the lake. I hope the photograph gives some idea of how magical it was. The weather for the past two weeks or so has been quite dry although very cold: the temperature on the higher fells has not rise above freezing. Needless to say, Judy and I have been out on the fells. 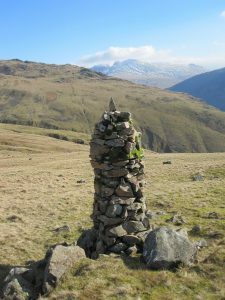 Buckbarrow, Seatallan and Middle Fell at Wasdale give wonderful views towards the Scafells and we found Joss Naylor’s cairn, said to be rebuilt on an ancient burial site. It was a lovely day but bitingly cold on the top of Seatallan so much so that my handkerchief froze in my pocket! We have walks earmarked for when it is either very dry or very frozen: Armboth Fell falls into this category as does The Nab at Martindale with its deep peat hags. 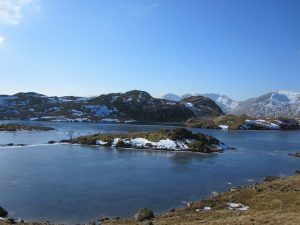 As we hadn’t done The Nab for a while we went across to Martindale Old Church from where we walked over Beda Fell to Rest Dodd and the Nab; Angle Tarn was frozen and the Helvellyns were covered in snow – beautiful. As we started the walk we met a guy coming off the fells with a largish rucsac and a dog and we could not resist asking him if he had been camping – yes he had, on the top of High Street! He did say he had a good tent!